Mien, a Vietnamese woman, is happily married and the mother of a son. Hers is a second marriage, we are told, following a youthful elopement that involved more pain than joy. She comes home from the forest one day to find that her first husband, declared dead in the "American war," has returned. Village officials expect Mien to honor the veteran, as do her neighbors, and Mien's own conscience instructs her to abandon happiness and prosperity for this shabby man, whom she scarcely recognizes. 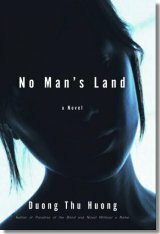 That's the front story of "No Man's Land," a novel by Duong Thu Huong. But the title refers equally to the nation in which the author now lives in internal exile -- a popular writer, age 58, long at odds with the Vietnamese government. Huong's books are banned in the Democratic Republic for their clear-eyed account of life "amid the dirty, hungry masses," as she puts it in "No Man's Land," "amid the heads bowed over bowls of watery [soup] in the grim state cafeterias, like livestock from numbered feeding troughs, eating from tin spoons that had been clipped to prevent theft." For the Western reader, this back story is easily as fascinating as the book itself. The Vietnam War, as we would call it, is seldom mentioned in "No Man's Land," and then only in passing: The one gift that Mien's first husband brings to her from his long absence is a bar of Camay soap. The translation, by Nina McPherson and Phan Huy Duong, is completely convincing. Mien's second husband, reflecting on their shattered marriage, realizes that 13 years have passed "as swiftly as the shadow of a cloud across the mountains." Not since Norman di Giovanni's renderings of Jorge Luis Borges's early fiction have I found a foreign story so accessible, or so moving. 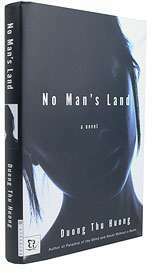 No Man's Land is set in a hamlet in the countryside of central Vietnam immediately following the end of the war in 1975, where a young woman, happily married to a successful farmer, comes home one day to find a throng of villagers assembled around her gate. She learns that her first husband, who reportedly died as a martyr and hero many years back, is in fact alive and has returned to claim her. Faced with immense pressure from the community and Party authorities, she dutifully agrees to leave her second husband and their son to live in a squalid shack with the veteran. This tragic twist of fate gives the novel a powerful narrative drive that makes it Huong's most accomplished work to date. Duong Thu Huong: No Man's Land Spike contributor Brendan Wolfe has a review of Duong Thu Huong's new novel No Man's Land over at January Magazine. Huong is an acclaimed Vietnamese novelist who, as Brendan points out, has provoked the wrath of the Vietnamese authorities on several occasions with her writing. Personally, I've only read Huong's third book, "Novel Without A Name", a beautiful and terrifying meditation on the Vietnam War. Her books tend to get lost because they get filed under "foriegn", the kiss-of-death literary equivalent to saying a film's got subtitles. But Huong's writing, even in translation, is sparse and shot through with different perspectives that twists language into new forms. The great tragedy of the Vietnam War, we tell ourselves, was its waste—all those young American lives lost in a lost cause. But not even victory redeems every sacrifice, as Vietnamese novelist Duong Thu Huong shows in her tragic novel No Man's Land. In the years following the war, the beautiful Mien is happily married to a prosperous plantation owner until a phantom from the past staggers into their idyllic mountain village. Bon is Mien's first husband, a North Vietnamese veteran; long thought dead, he has returned to take her as "his one piece of happiness," compensation for his grievous suffering during the war. With the eyes of the party upon her, Mien returns to the impoverished Bon, a traumatized shell of a man she no longer loves, thus setting up the kind of romantic triangle plotted to produce maximum pain on all sides. One can tell from the start that this tale won't have a happy ending for everyone, and not just because it begins with "a strange, violent storm"—perilously close to "a dark and stormy night." Huong is Vietnam's finest novelist, and despite her status as an enemy of the state, she continues to live in Hanoi. A former party member who led a Communist Youth Brigade sent to the front during the war to boost soldiers' morale, she was briefly imprisoned in 1991 for early works like Beyond Illusions (1987) and Novel Without a Name (1990), deeply personal novels that exposed the betrayal and hypocrisy at the heart of the Vietnamese regime. Politics on this level, however, are curiously absent from the doomed romanticism of No Man's Land, though the war casts its long shadow over Bon, who has been left enfeebled and virtually impotent from exposure to Agent Orange. The absence of personal outrage that fueled Huong's earlier works is keenly felt; too often No Man's Land becomes mired in prose as florid as Vietnam's climate, and Huong has a curious habit of placing her most dramatic events—a tortured birth, an attempted murder—offstage. But despite these limitations (and those of her translators), Huong endows her characters with life and a Buddhist appreciation for the impermanence of happiness. In her reckoning of love's toll, she reminds us that Vietnam was—and still is—more than just a war.